February 21, 2009 – 5 years later. I just happened to look at the date and realized that today is five years since I started blogging (how fitting, on my 500th blog on this blog, my ‘newer’ blog over the past five years). Five years since I began a journey that I had no idea where it would take me, literally, but also here, in this little space of mine. I had no idea how many people I would connect with, how many of those people I now consider very good ‘blends,’ – from attending their wedding in Mexico, to a summer weekend ‘upta camp,’ to visits in Atlanta, Austin, Chicago, New York City, Costa Mesa, Vegas, and even right here in Boston. I had no idea what I would discover about myself as a result of blogging, in sharing my story of divorce, discovery, renewal, and love, found, yet again. I had no idea of the connections I would make as a result of my passion for fitness, the barre (n9ne!) running, my relationship with food and my body, and being a fitness instructor. Again, literally, and also in processing my feelings, thoughts, emotions and milestones. I continue to go back to that feeling of realizing what a difference time really makes. And what a difference your life can look like as time spans on, especially as you take that life and shape it into a life you are proud of, and a life that feels fulfilled, happy and full of joy, love, and that (sometimes elusive) feeling of balance and peace. There, I said it. I’m 29 and I’m getting divorced. Never thought I’d be saying it or living it, to be honest. I decided to start a blog as I go through this journey because though it has only been about three months since this all started, I’ve gone through some massive changes and I thought a blog would be a great way to share my experience with those going through it, but also because there really aren’t any blogs out there that talk about divorce and moving on in your life with a very positive vibe. I see plenty that are all about looking back and wishing life had never changed, or being bitter about being abandoned by their former spouse. And, to be honest, I thought I’d fall into that camp as well, but I haven’t. I’ve really taken this time to figure out what I want in my life and have learned so much already, I can’t imagine where life will take me! Whoa. So weird to read those words and picture exactly where I was sitting when I wrote them. I’m proud of her ,and who she’s become. And while I am letting her go in favor of the me I am now, she has shaped me into who I am today. I’m damn proud. I don’t care if this post sounds a bit indulgent…I know it probably does, but after getting through the difficulties of divorce and all of the baggage that comes with it (poor finances, loss of a house, lack of confidence, sadness and loss), I’m not her anymore. And I thank you all for joining me in my journey and allowing me to share in yours. Cheers, friends. And that, my friends, is exactly the sentiment I stand behind day in and day out, be proud of your past, the ups and downs, the strife, the learning, and then let go of it and move on. Live the life you were meant to lead. One of the things I most admire about M is his ability to let things go, and slide off his back. For me, it is one of the most difficult. If something bothers me, I cannot.let.it.go. It affects my moon. It affects my actions. It seeps into everything I do or think. I’ve experienced some emotions of late that I don’t like in myself, as a result. I’ve felt some frustration that has led to anger, some jealousy that has led to bitterness. And these feelings are ugly. And they are *not* me at all. But at the core of these feelings is my incessant need to hold on to things and not let things go, and not see them for what they are, but for what I have made them out to be, due to overanalysis, assumption and well, overthinking. There’s that word again. Overthinking. So as M and I enter into the latest season of our lives together, my vow is to learn to let things go more. Not let little things bug me. 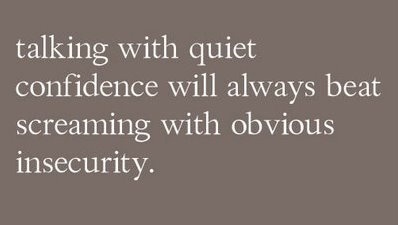 Not assume the worst (and instead, anticipate the best!) automatically. Not get angry as a first emotion, but think more rationally. It’s one of my ‘I’m not perfect’ downfalls…my ability to see negative first, and assume so much, when almost always, whatever is bothering me is almost completely born out of my assumption, or frustration, or snap judgement. Life is too short to just jump to the worst first. Why not have faith and trust and know that whatever is meant to happen in this life will, and to trust myself in being valued, being a good person at the core, and being worth it. On beauty and self image. 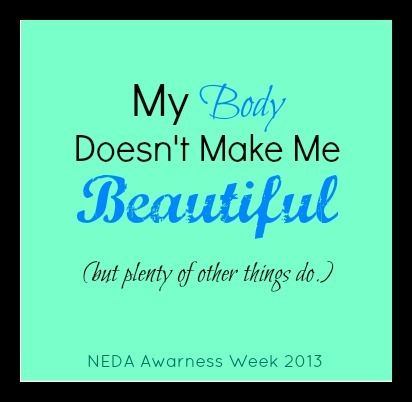 While it is far beyond National Eating Disorders Awareness Week (March 1), I tucked away an idea for a post after reading a few beautiful posts (Lindsay and Christine both struck me in particular, and Tina too!) on letters to your body and what makes you beautiful *beyond* what’s on the outside. Well, I’d like to do a twist on this, because while I have never had an eating disorder (fortunate/blessed not to), I have had a long history struggling with body and self image. While the past two years in particular, have been a huge journey in counteracting that, physically and mentally, I find myself sliding into days or even chronic days of picking myself apart. And I am honestly ashamed of it, and even worse, of admitting it, to myself, and to you all here. Because so much of it is baseless. Because so much of it is ‘in my head.’ Because so much of it is pointless. It’s sort of like worrying…it’ll give you something to do, but it won’t get you anywhere. What finally got me? This video. This video from Dove is absolutely stunning. It brought me to tears. And it made me realize that we certainly see ourselves vastly differently than anyone else does. The beautiful words people in this video chose to use to describe the person being drawn. And the expression on that person’s face, the more she heard those words being said about them. Happiness. Emotion. And finally? Realization that they had been describing themselves with negative words, not positive attributes. It’s what I have caught myself doing more than I’d like. And I need to get back to seeing myself the way others do. And valuing myself for who I am – determined, strong, happy, funny. I need to appreciate myself for who I am, and not who I am not, and love me for me, flaws and all. Because the flaws I see? I can guarantee only I see. Self – it is time to cut the sh*t. You. Are. Beautiful. Inside. Outside. Embrace you for all that you are…..for ALL that you ARE. First of all, thank you so much for your kind words, well wishes, and support for us as we launch into our first home together! It truly means so much to have so many, near and far, care, send support, and pray for us. More than words can say. I feel as though – again – I’m silently moving ahead with our plans, to live, to marry, to be and I am not quite sharing it all here. Yes, it is purposeful. Yes, it is with some sense of intent. And yes, it is worth doing this the way we want to do it, and moreso, for ME to do it this way. M knows about my blog, of course (though he used to not, as some of you know! ), and supports whatever I decide, in terms of how disclosive I am here, and in ‘real life’ with regard to…well, us. But at the same time, I *miss* sharing some of this excitement and progress here. And I plan to post more on these things, but probably more so after they have happened, similar to discussing our house plans. Partially out of fear of the proverbial ‘jinx’ and partially because privacy is often underrated, I think. And I need to respect that – for me, and us – more now than I ever have before. …just know that good things are in store. Big things. Fabulous things. Uniting things. Soon. Relatively soon. And it’s so damn awesome, I can hardly contain myself. Clearly. *file under: being secretive* <–though it is so damn hard!! In other not-so-secretive progress ‘news’ – it’s amazing how each day, I feel more and more in tune with my body. More ‘in love’ with me, versus writhing against who I am, my body, my habits. I feel like I own them more, I am confident behind them, and don’t need as many crutches as I have in the past. I own my eating habits. I know my body. I know what fuels it. I know what it likes. I know how to keep it balanced. And that has taken so long to get a handle on…but it’s been so worth it! I continue to focus on balancing the ‘smarter, not harder’ mantra, especially when I want to tiptoe over that line because I love what I do so much. I love to teach, yet I love to take classes, yet I love to run. But I can’t do it all, every single day. I need to choose, be selective, yet still get my ‘me’ workouts in where I can and where makes the most sense. Some days are harder than others to realize this, but then I go back to two things: be smart. And embrace the ability. So…life progresses. In so many good ways. And also in some upcoming challenging ways. But I feel ready. Far more ready than I ever have. And that is worth rejoicing, and embracing, isn’t it?